Revelation 10:7 speaks of the mystery of God being finished at the sounding of the last trumpet. We have been studying scripture and we have seen how it teaches that our gospel is a mystery and our gospel is not fulfilled. For review let’s look at what Revelation says. Scripture teaches that as the seventh and last trumpet is beginning to sound the mystery of God will be finished. We have learned that concerning our gospel we will be ruptured at the last trumpet. So we see that the mystery of God will be accomplished as the last trumpet sounds. We see the rapture the hope of Christians taking place at the last trumpet. We have, not a completely fulfilled gospel being fulfilled completely at the last trumpet. We shall finally shed this corruptible man and become like Jesus. We shall finally have Jesus bringing us our salvation. 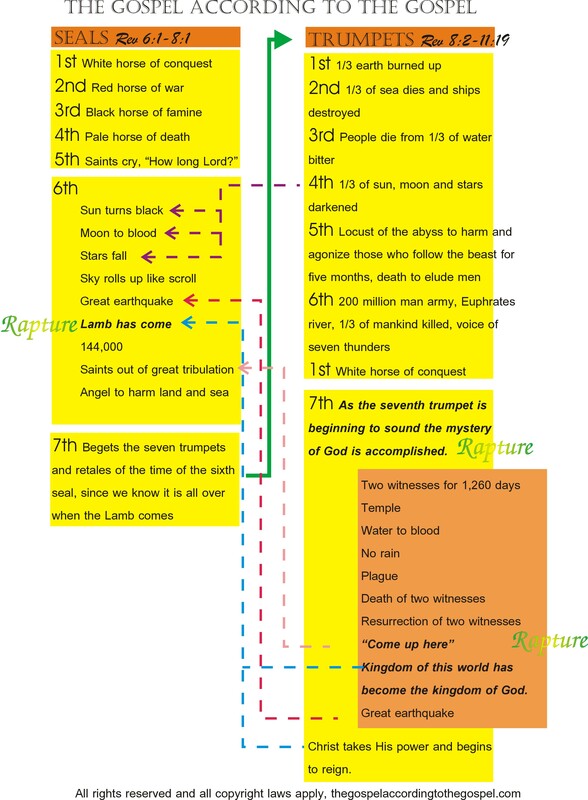 All of this and more occurs at the last trumpet, the last trumpet in revelation. This means our rapture takes place after all the seals and the other six trumpets. Only the seven bowls of wrath come after our rapture. This means that Christians are going to go through the great tribulation, but not the wrath of God. There are a whole lot of people who are expecting to leave this here terrestrial ball before the tribulation even starts. But if you believe in the mystery we have had passed down to us in the form of our gospel, you can no longer comfort yourselves in such escapism. In the last four parts of The Mystery of God series we have established with evidence upon evidence that our New Testament teaches that our gospel is the Mystery of God spoken of in Revelation chapter 10. Revelation speaks of a moment in time in our future that without delay our gospel will be finished. Jesus speaking of the last days also makes a very interesting comment pertaining to the accomplishment of something. He says that when Jerusalem is surrounded by her enemies that all things that are written may be fulfilled. We have the angel in the book of Revelation and Jesus declaring there is a time when all things written will be accomplished. If our gospel is this mystery spoken of in Revelation and Jesus mirrors this, then what is to be fulfilled in our gospel? After all, we are taught that our gospel was finished at the cross. Please review my post “More than nothing left to do” to review how scripture shows that Jesus fulfilled what He was sent to do and not sent the first time to complete our gospel. There is evidence upon evidence upon evidence that our gospel is no more finished as there is evidence that we are alive and not with Christ yet. So lets look at only a small portion of scripture that speaks of the Mystery of God (our gospel) that is yet to be fulfilled, and will be fulfilled when the seventh angel shall begin to sound his trumpet. Let us look at The Gospel According to the Gospel the gospel the church refuses to believe. The writer of Hebrews (maybe Apollos) declares that Jesus came the first time to bear our sins. He then supports what we have learned in this series, that Jesus did not complete our gospel, when he says that Jesus will not come to bear sin again, but to bring salvation. Scripture shows this mystery of our gospel is not complete. As much of a scandal it is for the church to see a scripture that teaches we await our salvation with Christ’s return. Paul tells the church that we are not adopted as sons yet. Even though we go around and teach we are adopted, Paul lets us know that we will be adopted sons when our bodies are redeemed and this happens at Christ return. For then we shall be like the man from heaven. Don’t believe adoption is yet to be, who hopes for what he has? To add scandal upon scandal, Peter too speaks of our salvation as coming in the last days. He further says our inheritance is kept for us in heaven while we are waiting for the coming of our salvation. So we have three that testify that our gospel is not complete. But it is not just three but Jesus who said all will be fulfilled in the last days when Jerusalem is surrounded. The angel who said our gospel mystery will happen as the last trumpet is being sounded. But more than this we have many upon many scriptures that teach our gospel is not complete, rather it is a hope. Even our salvation is not ours yet, we have yet to receive it. This is The Gospel According to the Gospel. The gospel the church refuses to believe. You can find proof upon proof from scripture about our unfulfilled gospel at the following places on my blog. To see more evidence that we have a hope of salvation click Got Salvation? To better understand this mystery called our gospel feel free to look at my statements of belief called Uncommon Belief. These scriptures that show our gospel is not fulfilled, will complement those verses that speak of our gospel as a mystery. Proving over and over again that our gospel is that mystery to be fulfilled at the sounding of the last trumpet. The scriptural teaching of the mystery of God (our gospel) being fulfilled in the last days further proves the validity of the The Gospel According to the Gospel – the gospel the church refuses to believe. In this Mystery of God series we have been demonstrating that the Mystery of God spoken of in Revelation chapter 10 is the fulfillment of our gospel. It is announced that there will be no more delay and this mystery of God will be finished and this during the sounding of the last trumpet. We have learned from our New Testament the following. What I have listed above and in the previous post on the Mystery of God is just a starting point of study about what we have in Christ. We have scripture testifying that the fulfillment of our gospel will be accomplished in the last days. And he made known to us the mystery of his will according to his good pleasure, which he purposed in Christ, to be put into effect when the times will have reached their fulfillment–to bring all things in heaven and on earth together under one head, even Christ. But is there more to the mystery of our gospel than just waiting for the rapture for us believers? Is something greater going on, that we have failed to see, in the mystery of our gospel that is yet be finished? Our New Testament reveals to us this is so. Next time we will look at the mystery of God (our gospel) that the church refuses to believe, which is yet to be accomplished on that day. This is a string of short post demonstrating that the Mystery of God spoken of in Revelation 10 is the fulfillment of out gospel. It is revealed in chapter 10 that there will be no more delay and during the days when the last trumpet is to sound the mystery of God will be fulfilled. This a the third post demonstrating from scripture that this portion in Revelation points to the day when our gospel will be accomplished. Many think that are gospel is accomplished and this at the cross, but it isn’t. For instance who has taken on their heavenly body and become like the man from heaven? I have been demonstrating that Paul clearly taught that this mystery was started before time began. That it will be accomplished in the last days. That it was preached by the prophets and of course it impacts us. Below is a complete break down of Col 1:10-28 pertaining to the mystery. Don’t forget to look at the other scripture in parts 1-3. (Col 1:10 NIV) And we pray this in order that you may live a life worthy of the Lord and may please him in every way: bearing fruit in every good work, growing in the knowledge of God,(Col 1:11 NIV) being strengthened with all power according to his glorious might so that you may have great endurance and patience, and joyfully(Col 1:12 NIV) giving thanks to the Father, who has qualified you to share in the a. inheritance of the saints in the kingdom of light. (Col 1:13 NIV) b. For he has rescued us from the dominion of darkness and c. brought us into the kingdom of the Son he loves,(Col 1:14 NIV) in whom d. we have redemption, the forgiveness of sins. (Col 1:15 NIV) He is the image of the invisible God, the firstborn over all creation. (Col 1:16 NIV) For by him all things were created: things in heaven and on earth, visible and invisible, whether thrones or powers or rulers or authorities; all things were created by him and for him. (Col 1:17 NIV) He is before all things, and in him all things hold together. (Col 1:18 NIV) And e. he is the head of the body, the church; f. he is the beginning and the firstborn from among the dead, so that in everything he might have the supremacy. (Col 1:19 NIV) g. For God was pleased to have all his fullness dwell in him,(Col 1:20 NIV) and h. through him to reconcile to himself all things, whether things on earth or things in heaven, by i. making peace through his blood, shed on the cross. (Col 1:21 NIV) Once you were alienated from God and were enemies in your minds because of your evil behavior. (Col 1:22 NIV) j. But now he has reconciled you by Christ’s physical body through death to k. present you holy in his sight, without blemish and free from accusation–(Col 1:23 NIV) if you continue in your faith, established and firm, not moved from the hope held out in the gospel. This is the gospel that you heard and that has been proclaimed to every creature under heaven, and of which I, Paul, have become a servant. (Col 1:24 NIV) Now I rejoice in what was suffered for you, and I fill up in my flesh what is still lacking in regard to Christ’s afflictions, for the sake of his body, which is the church. (Col 1:25 NIV) 1. I have become its servant by the commission God gave me to present to you the word of God in its fullness–(Col 1:26 NIV) 2. the mystery that has been kept hidden for ages and generations,3. but is now disclosed to the saints. (Col 1:27 NIV) 4. To them God has chosen to make known among the Gentiles the # glorious riches of 5. this mystery, which is Christ in you, the hope of glory. (Col 1:28 NIV) We proclaim him, admonishing and teaching everyone with all wisdom, so that we may present everyone perfect in Christ. Paul list all these things that has been a mystery and is now revealed, which is Christ our hope. He says to the believer that all this will apply to us if we hold firm and are not moved from the hope held out in the gospel. This mystery is our hope as Christians. Next week we will look at this hope and how it impacts what we read in Revelation 10. You will see scripture clearly teaches our gospel is not accomplished at present, but it will be when the last trumpet sounds. We are continuing our search through scripture that supports the idea that the mystery of God in Revelation chapter 10 is the fulfillment of our gospel. There are four questions that we are looking at that scripture over and over again answers. These are those questions pertaining to the mystery of God. If it is to finally be finished, when was it started? Who knows about this so called mystery of God? Does this mystery of God impact us? Paul lets the church in Rome know that he preaches the gospel, the proclamation of Christ, according to opening up of the mystery that has been hidden. His proclamation of Christ is the revelation of this mystery. This mystery was spoken of by the prophets and was written down for us at God’s command so that all nations might believe and obey God. Again in every way Paul has demonstrated that the mystery of God is our gospel. Now to him who is able to establish you by my gospel and the proclamation of Jesus Christ, according to the revelation of the mystery hidden for long ages past, (which was kept secret since the world began) but now revealed and made known through the prophetic writings by the command of the eternal God, so that all nations might believe and obey him–to the only wise God be glory forever through Jesus Christ! Amen. Paul elaborates on a new idea that has not been introduced yet in this study. The mystery is the grafting in of the gentiles into the promises of Israel, though the hardening or their hearts. To this all us gentiles say. Praise God. We will see that the more we look into the mystery of God the more and more scripture describes this mystery as our gospel. Paul teaches us the mystery reveals we will be like the man from heaven, when we will be gathered at the last trumpet. The mystery is we will no longer be cursed by sin and death. We understand that when the last trumpet shall sound death will be swallowed up. And just as we have borne the likeness of the earthly man, so shall we bear the likeness of the man from heaven. I declare to you, brothers, that flesh and blood cannot inherit the kingdom of God, nor does the perishable inherit the imperishable. Listen, I tell you a mystery: We will not all sleep, but we will all be changed–in a flash, in the twinkling of an eye, at the last trumpet. For the trumpet will sound, the dead will be raised imperishable, and we will be changed. For the perishable must clothe itself with the imperishable, and the mortal with immortality. When the perishable has been clothed with the imperishable, and the mortal with immortality, then the saying that is written will come true: “Death has been swallowed up in victory.” “Where, O death, is your victory? Where, O death, is your sting?” The sting of death is sin, and the power of sin is the law. But thanks be to God! He gives us the victory through our Lord Jesus Christ. God has made know to us the mystery of His will as it has pleased Him. This mystery was purposed in Christ and will be put into effect at the time of the end. The mystery of His will reveals that when it is put into effect all things will be under Christ. By the purpose of His will we were chosen before the creation of the world for adoption. The mystery of His will is done with all wisdom and understanding. Praise be to the God and Father of our Lord Jesus Christ, who has blessed us in the heavenly realms with every spiritual blessing in Christ. For he chose us in him before the creation of the world to be holy and blameless in his sight. In love he predestined us to be adopted as his sons through Jesus Christ, in accordance with his pleasure and will–to the praise of his glorious grace, which he has freely given us in the One he loves. In him we have redemption through his blood, the forgiveness of sins, in accordance with the riches of God’s grace that he lavished on us with all wisdom and understanding. And he made known to us the mystery of his will according to his good pleasure, which he purposed in Christ, to be put into effect when the times will have reached their fulfillment–to bring all things in heaven and on earth together under one head, even Christ. In another place scripture talks in depth of this mystery. This mystery was revealed to Paul, explaining why he wrote of it so much. It was also made know to the Prophets and other Apostles. It is confirmed that this great mystery includes us gentiles sharing in the promises of Christ and heirs with Israel. And lastly, Paul’s purposes is to make plain the administration of this mystery which has been hidden from the beginning of the world. Note how many times Paul uses the word mystery in this portion of his letter. Surely you have heard about the administration of God’s grace that was given to me for you, that is, the mystery made known to me by revelation, as I have already written briefly. In reading this, then, you will be able to understand my insight into the mystery of Christ, which was not made known to men in other generations as it has now been revealed by the Spirit to God’s holy apostles and prophets. This mystery is that through the gospel the Gentiles are heirs together with Israel, members together of one body, and sharers together in the promise in Christ Jesus. I became a servant of this gospel by the gift of God’s grace given me through the working of his power. Although I am less than the least of all God’s people, this grace was given me: to preach to the Gentiles the unsearchable riches of Christ, and to make plain to everyone the administration of this mystery, which for ages past was kept hidden in God, who created all things. We have discovered that the more we look into the mystery of God we find our gospel. We find Christ and gentiles who share in the blessings of Israel. We find we will be like the man from heaven and the curse of death will be broken. All of this will be accomplished when the death is swallowed up at the last trumpet. All of this will take place when Jesus takes His kingdom at the last trumpet. Again what does this mean for the debate over the pre-trib rapture?